It seems Alistair Darling has been cast aside after his disastrous tv debate performance with Salmond, and Gordon Brown has been put in charge to make the case at this late hour. Such a change from the Yes team would have been pounced on by a conscious and professional media (see here for a neat synopsis of media problems). So instead it’s come to this. Gordon Brown playing the Jock on the Big Telly to the whole of the UK (‘Scotland Decides – the Dimbleby Interviews’, BBC 1 broadcast Tuesday 16 Sept 2014). He points to David Dimbleby: “You’ve just come up from London on a day trip”. Few will miss the irony. Dimbleby bristles. We’re all interested in Scotland now. For a bit anyway. “I’ve been up and down for weeks”. Brown is at pains to get the mood right. He talks of talking direct to his ‘fellow Scots’ (something he has failed to do throughout the whole campaign , instead relying on pre-packaged invite-only events). This is the man who spoke of ‘British Jobs for British Workers’ and urged us to plant Union Jacks in our gardens. It may be too late for the patriot game. Instead what we’re offered today is The Vow. It’s like The Voice but instead of Tom Jones, Will.I.Am and Kylie we have Nick Clegg, Call Me Dave and Ed Mil.I.Band. Their backs are away from us as they offer a vow, but no-one knows what it is. It’s a great idea for a game show. “We’ll give you something (we won’t say what) but we’ll give you it really quickly“ seemed to be today’s pitch. There seems to be a recurring problem with time in the No campaign’s whole approach. Remember they wanted the referendum, first not at all, then ‘bring it on’, then back to ‘Never’ and lines in the sand, then they wanted it ‘immediately’, and stop ‘messing about’ was the line. The long complaints about ‘when will this be over?’, like kids in the back of the car. It’s the same with the ‘the most successful union ever in the history of humanity’ claim. So we have this long stretching back, always backwards, then this sudden huge leap forward into an abyss of The Vow. Timing has been a problem for Brown throughout his career, and now he’s shadowed by three other politicians whose careers seem untimely. Miliband who says nothing, Clegg who said too much and Cameron who listens thoughtfully. Remember this is the man who now lectures us on pensions but laid waste the pensions industry. In 1997 Gordon Brown’s notorious “pension stealth tax” reduced the value of retirement funds by at least £100 billion. And now? Gordon Brown talks to Dimbleby about the UK as a powerful force for redistribution, ‘between regions and nations’ … ‘Home Rule’ … even listening very closely it’s difficult to discern what he’s actually saying. It goes something like this: Britain is centralised, undemocratic and unfair, but we can fix it. Britain is broken in different ways and each constituent part gets a different part to fix the way its uniquely broken, so Scotland gets pensions, and Wales gets disability benefit and London gets housing benefit. It’s one of the strangest, most garbled political narratives you are ever likely to hear. As Robin McAlpine has written: “It is often difficult to tell whether Brown is delusional or dishonest. Either he really believes that the UK is redistributing wealth as a result of an economic model he put in place (delusional) or he is just telling Scotland that in the hope we’re stupid (dishonest). Either he really believes that the UK economy is sound (delusional) or he just wants to distract Scots from the reality of modern Britain (dishonest). Either he thinks he is viewed as a giant of Scottish politics (delusional) or… Actually, this is just plain delusional. Attempts to resuscitate the corpse of British democracy will fail, not because they might not be good ideas, but because they are issued from an imaginary power base. Brown may be surrounded by a faithful press pack and party acolytes but he is further from power now than he has ever been. His Fife bunker may be well-appointed but it suffers from Northern Exposure. Brown’s detachment from reality – and from the processes of democracy is not a surprise. His appearance as Prime Minister had little to do with normal process. Brown was not of course elected, parachuted from On High, or installed by an indignant mob: over many years he materialized in fits and starts, glimpsed intermittently like a ghost from times past, brooding but saying almost nothing. Then suddenly the spirit was there, seated all too comfortably in the Anglo-Brit living room, account-books and Britannic sermons to hand. The armchair’s previous occupant had left for Jerusalem. Such is death in life. Now he reappears like a Ring-Wraith to protect Britain, the Zombie Nation speaking gibberish to the faithful. Not so much speaking truth to power as speaking power to truth. He talks of realising that ‘change is in the air’ but it’s ‘the wrong change’. He will bring about the ‘right change’ but he can’t tell us what that is. Of course we don’t produce any food here, so it has to be trucked north to our greedy feckless outstretched hands. We should be grateful they keep it cheap. It’s such a gratuitously offensive concept, but this insult lies buried and lost within the wider thinking of Better Together as us a donor recipient. All the ‘pooling and sharing’ all this empty talk of a ‘sharing Union’ doesn’t hide the reality of the Poverty in Scotland 2014 report that outlined how UK austerity measures will push 100,000 more Scottish children into poverty by 2020. Time’s up. It’s slipping away. Even Dimbleby knew it. The only thing Brown and the rest of the Unionist mob are saving is their jobs! Gordon Brown was interviewed on American ABC News by Diane Sawyer he said and I quote ” I come from North Britain. ” He couldn’t bring himself to utter the very name of our nation, Scotland. How many times can this creep stab his own country in the back ? There’s nothing quite like a self loathing Scot, is there ? He has the same problem uttering the name of my nation too, always referring to it as ‘regions’. Mind you, I bet he has no problem shouting, “get into those English bastards” whenever we face each other in the sporting arena. I always thought there was nothing like a self-loathing English person, but I guess such people are much the same anywhere – always miserable and wanting everyone else to be miserable, always treacherous and never to be trusted. Gordon Brown is a liar. Full stop. Scotland is not a country as far as these British Labour careerists are concerned which is why they pay lip service to devolved power. Devolution is a mechanism to pacify the restless natives so that North British politicians can continue to enjoy life high on the hog. Patronising arrogance is their main characteristic with a degree of hypocrisy thrown in when they pretend that devolution is a good thing in that it protects Scots from policies being implemented by the British parliament. In saying this,they make it absolutely clear that people in Scotland are going in a totally different direction from those south of the border and make the case for a fully accountable (fully funded) government here in Scotland. I’ve always felt uncomfortable when I’ve heard Gordon Brown’s slogans – they’ve never hit the mark anywhere – just empty PR. …and assuming a YES, best wishes for more civic democracy throughout the rUK. I have enjoyed reading your constructive criticisms. As the Oakland Raiders would say, just win, baby. It’s just a shame the Raiders don’t do much winning themselves. When Gordon Brown speaks or should that be drones on and on, it’s all slogans, sound bites, platitudes, banalities, inanities, it’s excruciating, after listening to one of his mind numbingly tedious speeches, one comes away with the feeling of you can’t remember a thing about it !! Yet people pay good money to attend his lectures. What gives? Years ago, when Inde was beginning to bubble up I recall a lawyer saying to a politician on tele that it was the legal profession which maintained what was left of integrity here in 1707 ” when you all wanted to run south to pretend to be English “. Broon took elocution lessons in an attempt to assimilate, while Salmond harangued and finally left Westminster for Holyrood. “the Westminster connection has justified their careers” is the corollary to what Salmond stands for and explains why most of the Lab/Con/Lib dross left to put the case at Holyrood simply cannot hold a candle to the likes of Harvie, Sturgeon, let alone Salmond. If Crash Gordon took elocution lessons, then his tutor was taking the piss as well as his money, although Brown probably put the lessons down on his exes claim form as ‘miscellaneous’. He still sounds Scottish to English ears, but what sticks in our craw is his rabid Anglophobia and general spiteful malevolence. Alex Salmond is interested in Independence for what it delivers for the people of Scotland regarding social justice. To imply otherwise is an attempt to mislead. You really have swallowed it all hook, line and sinker. His Pension Fund raid and the Gold Reserve sell off were a step too far. He also said that his new powers would be written in stone… as a child of the Manse he would be converse with the imagery and symbolism here…. nothing like comparing yourself to God is there, Gordon? Your rambling pomposity knows no bounds! How do you know Gordon Brown is telling lies ? Answer, He’s moving his lips !! In spite of the bravado in the interview I thought Brown was nervous. If you watched his feet they were rocking back on his heels most of the time. He was doing a Darling in spouting forth at a great rate of knots to ensure he got it all in. I was quite impressed by Dimbleby’s questioning. In spite of Brown s defections Dimbleby always came back to the actual question he asked, but Brown continued to be evasive. I did think Dimbleby could have destroyed Brown on a number of topics, e.g. his pensions raid and the fact the UK pensions are the worst in Europe. Another thing that annoys me is Labour’s claim that devolution was all down to them when many Labour people were against it. I have never heard it debated in public about the claim by some that Britain was forced into giving Scots devolution by the EEC (as it was then), because the EC were on the point of trying to bring a number of the Russian satellites in as members and to see any sort of shenanigans over Scotland’s desire for a devolved government would have been a no no. ”The deception of others is rooted in the deception of oneself.” I think Gordon Brown is both, delusional and dishonest. 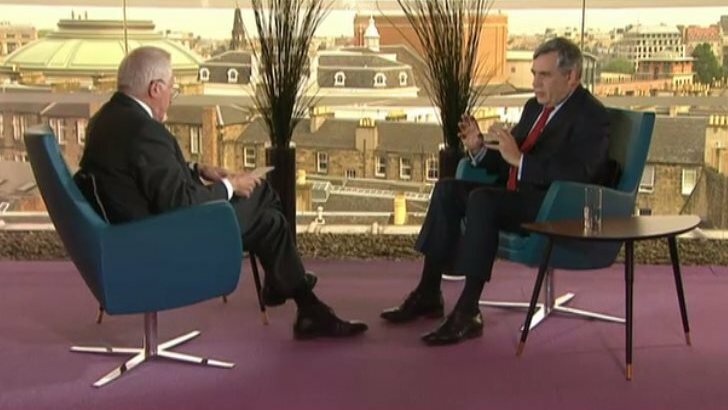 Gordon Brown walks out of a TV interview in a HUFF, you just take can’t him any where, can you ? he isn’t house trained. Three years of fear, smear and media misdirection. The past fortnight has seen them dial up the volume to eleven. I’m not impressed, I’m not afraid, I’m angry and determined. Tomorrow its our turn to have our say and pass judgement on the state and its representatives, who have with deliberation, released this strategy upon the Scottish electorate. Its our turn to counter fear with hope and confidence. Mr Brown and the institution he represents have failed the people of Scotland on every level for the last time. Their most recent failure being their conduct throughout this campaign toward their own electorate. We’re done with the politics of fear. Tomorrow, let’s show them the door. Win or lose the referendum, Darling’s campaign has disaffected a large section of the Labour Party’s support and they have gone to the RIC and others. Brown has been sent to reasure them that Labour is still the party for them. If he contributes to a No all fair and well, if not Scottish Labour will stand a chance of gaining influence in an independent Scotland. He seems to be so delusional that he just not understand what dishonesty is. Anything he says, like the £2 billion oil revenues would be all of Scotland’s revenues after independence and would not support all the oap pensions in Scotland. Maybe innumerate should be added to his character. On The National News the BBC tell us about the increase in employment figures. It also tells us that wages are well behind inflation and it could be years before they catch up. On BBC Scotland they tell us about the increase in employment figures but no mention of low wage levels. There is also an outside broadcast from a hotel in Glasgow which has taken on a couple of new employees and the BBC paints a picture that everything in the garden is rosy. This is a perfect example of how BBC Scotland manipulates the news to suit its Better Together agenda. How many job loses do you think is acceptable to achieve your dream of independence? How many home repossessions do you think is acceptable to achieve your dream of independence? Both will definitely happen to ordinary working class scots as a direct result of independence! Typo – I meant none! So how many do you think is acceptable then? We yesterday received in the post a BT leaflet which contains a number of flat out lies. Well, this is perhaps the only statement that is not a lie. It is merely speculation and a scare story. It will not happen in Scotland alone if we keep using the pound, but in the entire UK, if it happens at all. What is certain is that interest rates will rise over the next five years, because the Bank of England has said so. I received an invitation to one of Gordon Brown’s ticket only book evenings. Oh, you thought he was just talking about voting NO? Actually he was promoting his book and confirmed that he would sign copies after the talk. I suppose you would have to buy a copy for that – I declined the invitation. No is the progressive vote that will bring more devolution. Independence and seperation is a huge unnecessary gamble with our future our children and our grandchildren’s futures! Consider that No devolution is on the table, the Vow on the Record is value and meaning less, Do you honestly think that the Westminster Government are going to anything? With at least 70 Conservative vocally against any more to Scotland, how would it pass ?